Cathaoirleach of Galway County Council, Mary Hoade; Ruth Fahy, Galway WFC Player of the Year; and Don O’Riordan, manager Galway WFC at the club’s annual awards event. 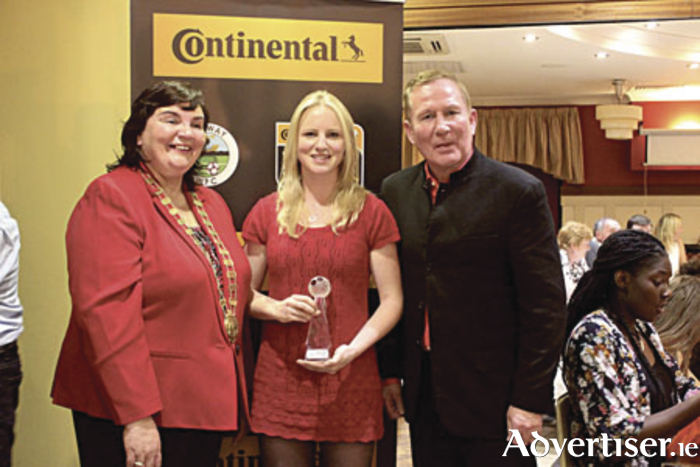 Ruth Fahy was named Player of the Year at the annual Galway WFC awards night held in Claregalway. The team was presented with a Galway Crystal Plate to recognise its achievement of winning back to back All Ireland Senior Schools titles. It was also announced that Advance Pitstop is to become a sponsor for the coming season.